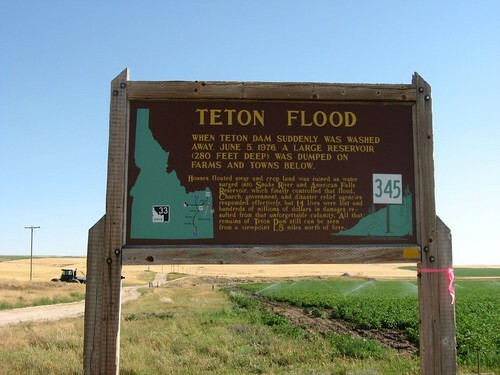 When Teton Dam suddenly was washed away, June 5, 1976, a large reservoir (280 feet deep) was dumped on farms and towns below. Houses floated away and crop land was ruined as water surged into Snake River and American Falls Reservoir, which finally controlled the floor. Church, government, and disaster relief agencies responded effectively, but 14 lives were lost and hundreds of millions of dollars in damages resulted from that unforgettable calamity. All that remains of Teton Dam still can be seen from a viewpoint 1.5 miles north of here.